In pdfToolbox Standalone we inform you about available software updates. How can you customize these notifications? We will show you in this tutorial. As soon as a new major version is available for download, a notification bar in the main window of the Standalone version is shown. This functionality is not available in the Acrobat Pro PlugIn. You can either download this update directly using the "Download" button or hide this notification using the "X". When you hide the notification you'll be asked if you want to be notified with the next start of the software or if you do not want any information about this update anymore. 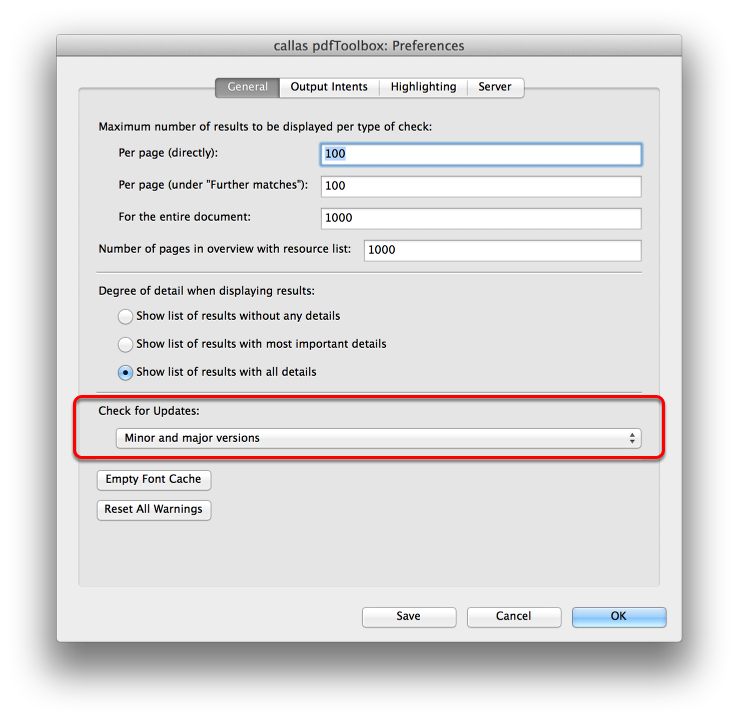 These settings can also be set in the preferences (more information further down in this tutorial). Additionally, you can switch to the callas software homepage for more information about the update. New major versions contain a bigger number of new functions as well as significant improvements regarding processing. Major versions are installed in parallel to existing versions - so you can continue to use them. A new license key is necessary for new major versions as well as a new activation. Owners of a valid software maintenance agreement (SMA) will receive a new keycode from your reseller or integration partner. If no SMA exists, you can buy an update on the callas software website or at a local reseller. More information is shown using the "Info" button. After the first start of the software after the update you'll be asked if you want to import your settings (e.g. own Profiles, ProcessPlans, Checks and Fixups) into the new version. Please note: Profiles or Libraries exported from new major versions cannot be imported in older software versions. Profiles or Libraries from older versions can be imported into newer versions of course. If you want to have the possibility to switch back to a previous version, we recommend a backup of your Profiles. 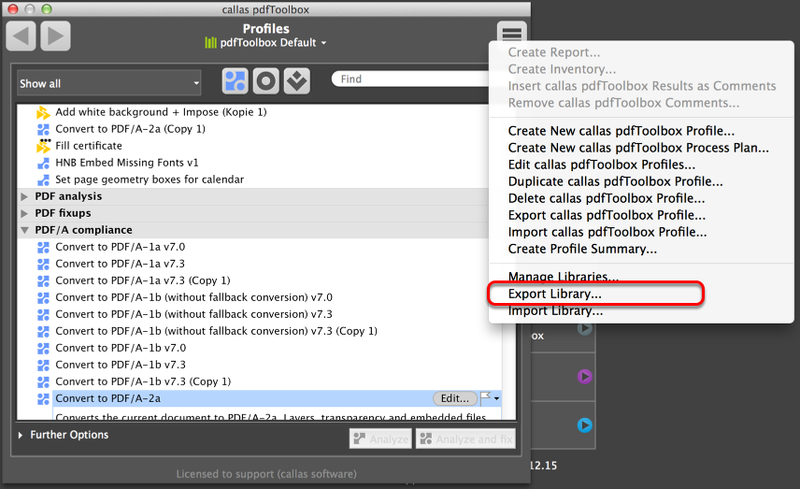 More information about this feature in "Export Libraries" further down. As soon as a new minor version is available for download, a notification bar in the main window of the Standalone version is shown. This functionality is not available in the Acrobat Pro PlugIn. Minor versions are software updates, which not only contain bugfixes and performance improvements but also new functions. User of the respective major version of the Desktop software can update free of charge. User of the Server/CLI version needs to have a valid SMA. You can either download the version using the "Download" button or hide the notication with the "X" button. In case you hide the notification, you can choose if you want a reminder at the next software start or if you want to skip this version update. These settings can also be defined in the preferences of the software (more about this feature later in this tutorial). New minor versions can offer new Checks and Fixups as well as new settings for existing Checks and Fixups. Sometimes also new, predefined Profiles, Checks and Fixups are contained (can easily be identified by a suffix behind the name - e.g. "v8.3"). Therefore it is not possible in most cases, to switch back to a previous minor version (e.g. from version 8.3 back to 8.2). Intensive internal regression tests ensure that a customer should not have any problem with an update. If you want to keep the possibility to switch back to a previous minor version, we recommend a backup of our Profiles. More information in the chapter "Export Libraries". In the "Help" menu you'll find "Check for updates", which will check for the latest available versions. Using the menu bar, you can open the software preferences. In the "General" tab in the preferences, you can easily define if the software shall check for updates. And if yes: whether it should happen for major versions, minor versions or both. You can Backup your set of Profiles using the Profiles window, options button in the upper right corner, "Export Library". This will save your Library into an external file. If you have more Libraries, each Library must be saved separately. An exported Library will be stored into the selected folder. You can either import this Library on another computer or use this backup for an import later.